Readers of these words will never again flick through their copy of Building Design magazine each week. After many decades (I first wrote for the title almost forty years ago) it will no longer be on the page, disappearing to the online world, behind a paywall. What I have written is no longer a column in the physical sense, a way of seeing text on the page, an article in print. As wood pulp gives way to the screen –computer or tablet or phone – and there’s less and less reading material stacked up on our desks or breakfast tables, we’re all forced to look elsewhere for reading matter. Take the growing fascination with ghost signs – those gable ends or forgotten walls that offer wonder cures or dry goods in shadowy blocked lettering, evocative reminders of forgotten remedies, vanished businesses and obscure commodities – and which lift a dull stock brick elevation in a nondescript street to new heights of interest and, who knows, might even ensure its preservation. In France they are ubiquitous; in my family, because of my daughter’s name, we passed the long hours of holiday journeys counting the gentian blue and acid yellow Suze signs on walls in every French town and village. The digestif still exists, but it is the signage that is as inextricably part of France as old Citroen garages. 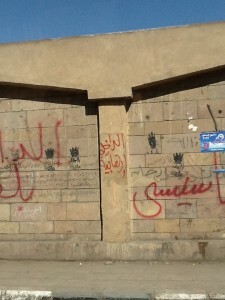 In Egypt, the writing has always been on the walls. The glorious mysteries or, for the initiate, the histories and myths represented by surviving hieroglyphics are evidence of lives and beliefs of extraordinary complexity. 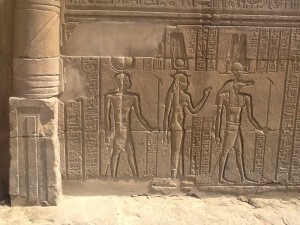 Whether they blanket entire surfaces or simply pepper the intervals between the figures of pharaohs, their consorts and their cacophony of deities, the marks were a coded pictorial language for the few, largely dedicated to a world beyond this. It was not until the final years of the 18th century, that European travellers (and ‘collectors’) began to be brazen enough to carve their own names and dates onto the walls, often high up on the then engulfing sand. Napoleon’s men used the revolutionary calendar, while the circus strongman Giovanni Belzoni (who shipped Sethi I’s sarcophagus carelessly back to London and into the basement of Sir John Soane’s Museum) simply wrote his name a little larger than anyone else. In the 21st century graffiti, like the ghost signs, carries another level of significance altogether. Take the streets of Cairo as they bring the story of Egyptian politics up to the present, with a bump. Banners are strung across street corners, blank walls and hoardings coated in a dense collage of posters from yesterday, the day before yesterday and tomorrow (I refer to a figurative timescale) telling a story which is far from easily told nor anywhere near resolved. 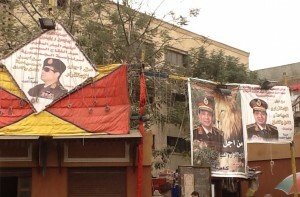 Some, the more slick versions of pre-election publicity (although as I write the date is not yet fixed, nor the presidential candidates named), proclaim military intelligence chief General Sisi as the heir to strongman Presidents Sadat and Nasser. 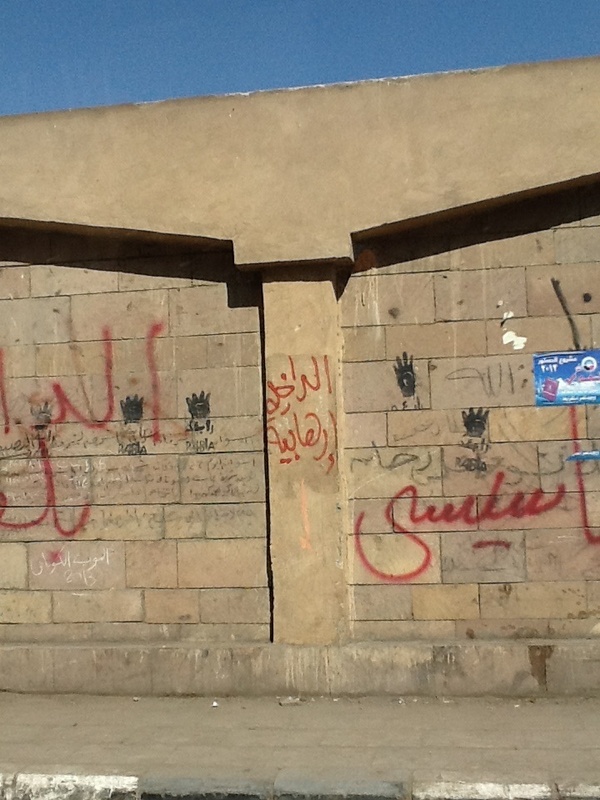 Elsewhere graffiti includes black stencilled palm prints – the menacing sign of the outlawed Muslim Brotherhood – or red scrawled Arabic messages which translate into wishing Sisi the worst of all possible fates.